Don’t wait until the time is right..say, "yes" now. Procrastination is by biggest downfall in life. There, I said it. I’m sure that those of you who know me well (or know me at all) know that one of the phrases I say is “It’s not that I wait until the last minute, it’s that the last minute is the first minute I have to do it!” I think that’s really just me trying to convince myself that my procrastination isn’t impeding my goals in life–whether simple daily goals or the big-audacious-God-sized goals that I dare to dream from time to time. 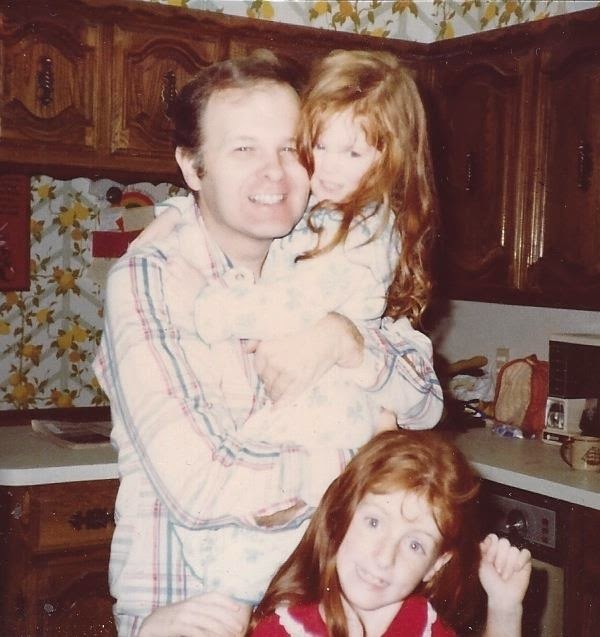 My daddy, holding my little sister. I’m the one making the ridiculous, goofy face. Being a procrastinator has plagued me for life. I remember as a child, probably 9 or 10 years old and hearing my dad say some comment here and there about how I need to stop procrastinating. I, of course, would ask what that big word meant and in typical parent-of-the-80s fashion, he’d say, “go look it up, Kristin.” (Kids…translation to 2014: google it.) Over the course of about a year (I’m not joking), my dad and I would have this exchange more often than I care to admit. Imagine the “ohmygoodness” palm-to-the-face moment I had when I FINALLY decided to get out the dictionary (yes, kids–no smart phone or internet back then to look it up!) only to find the definition of “procrastinate” pretty much had my name written on it. I’ll do it later…when I have time. I want to be able to do that perfectly and if I do it now, it won’t be perfect. I want to do this, but __________ needs to be finished/ready/out of the way first. I’ll wait until we have more money. I’ll wait until the time is right. In the last few months, I have started following Kristen Welch AKA “We are THAT Family” on various social media platforms. 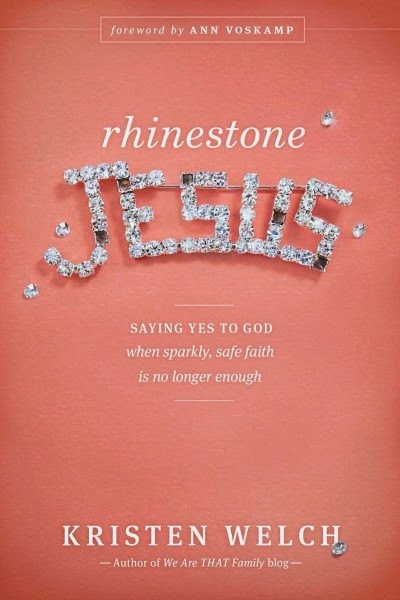 About a month ago, she posted information about pre-ordering copies of her soon-to-be-released book, Rhinestone Jesus: Saying Yes to God When Sparkly, Safe Faith Is No Longer Enough . I was intrigued and had also been praying about ways that I could connect with more of the moms at our church as well as moms who drop off their children at our church’s preschool. I had thought about a book club for a while and figured that this might be good to use as our first book. I ordered a few copies and sat down to start the book the other day. God doesn’t want us to wait until (what we determine to be) the perfect moment comes along to serve God. God doesn’t think that we can’t serve if we have a house full of kids with runny noses, messy rooms, and busy schedules. God doesn’t want us to be overwhelmed when we feel called to do something. God doesn’t expect us to only take on the stereotypical “BIG” things. No, God wants us to stand still long enough to say “yes” right where we are—in the middle of our mess. In the middle of our everyday, sometimes mundane-what-are-we-doing-it-can’t-make-a-difference lives. After all, I’m “just” a mom, I’m “just” a wife, I’m “just” a working woman, I’m just…not someone whom God would call to do big things. In reading this book, I have reconnected with the passion I have to be the best I can be for my children, for my husband, for the ministry I share through my job at the church. I can say, “yes” in my mess and not feel I should wait until that miraculous (non-existent) day when I feel I have it all together. The first “yes” I am answering is to put together a summer book club for women around the Waco area. Kristen’s book will be our first book—we’ll gather around a table (I love to eat) and share a meal while we share our “yes” stories after reading the book. 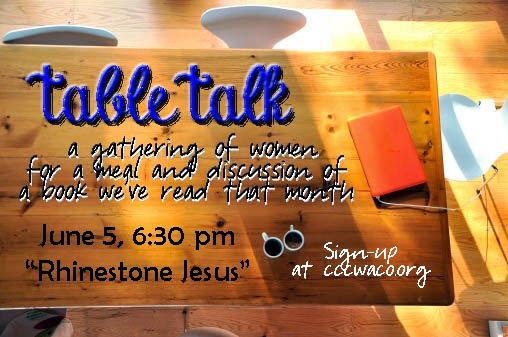 Sign up for our first table talk. I can’t wait to see how many women say, “yes” to reading this book together!